Editor/Author Blake, Nigel, Smeyers, Paul and Smith, Richard D., et.al. 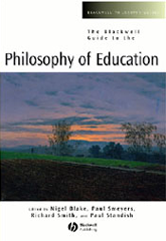 In this important survey, an international group of leading philosophers chart the development of philosophy of education in the twentieth century and point to signficant questions for its future.Presents a definitive introduction to the core areas of philosophy of education. Contains newly-commissioned articles, all of which are written by internationally distinguished scholars. Each chapter reviews a problem, examines the current state of the discipline with respect to the topic, and discusses possible futures of the field. Provides a solid foundation for further study.